Unveiled in February 2016, the Himalayan is a motorcycle purposebuilt for adventure touring and exploring Himalayas. With a fully ground-up design, strong mono shock rear suspension, dual purpose tyres combined with agile handling, powerful new LS 410 engine, and ability to deliver high torque and usable power at lower RPMs, it is the most appropriate choice for mountains and uneven terrains. Besides, its 15-litre fuel tank and mounting points for luggage make it ideal for long distance touring. One of its key features is its ergonomic sync between footpegs, handlebar and seat height that provides a comfortable upright riding posture, necessary for long rides. It is also loaded with a simple instrument cluster that keeps track of speed, direction, ambient temperature, travel time, service intervals and multiple trip distances. The motorcycle has clocked lacs of kilometres of meticulous testing and benchmarking across multiple terrains before finally being sent to production. We have endeavoured to ensure that each motorcycle rolling out from our manufacturing line has exacting quality standards. In March 2016, this much-awaited harbinger of adventure touring along with a range of meticulously designed, purpose-built protective riding gear, appropriate for inhospitable locations, challenging terrains and extreme weather conditions, was launched across all outlets in India. The Himalayan has created an entirely new segment of adventure touring in India. The sub-continent, being home to some of the world’s highest motorable roads and diverse geographical features, proves to be an apt location for it. Besides, the motorcycle was also showcased and launched across several locations including Colombia, Australia, the UK, and Europe. A lot of these launches were in Euro IV compliant models to meet the new emission norms. In November 2016, Royal Enfield paved the way for a purer, non-extreme and more accessible form of adventure touring in Bogotá,Colombia through the launch of Himalayan. Apart from encouraging touring in Colombia, the launch would play a crucial role in establishing Royal Enfield’s association with a purpose-built versatile motorcycle best-suited for mountains like Parque de los nevados. Royal Enfield launched the Himalayan in Australia, at the Melbourne Moto Expo 2016. The motorcycle received tremendous response from the existing motorcycling community in the country, given its accessibility and simple-go-anywhere proposition. Every year, Royal Enfield brings together its rider community to celebrate the spirit of adventure and leisure motorcycling. 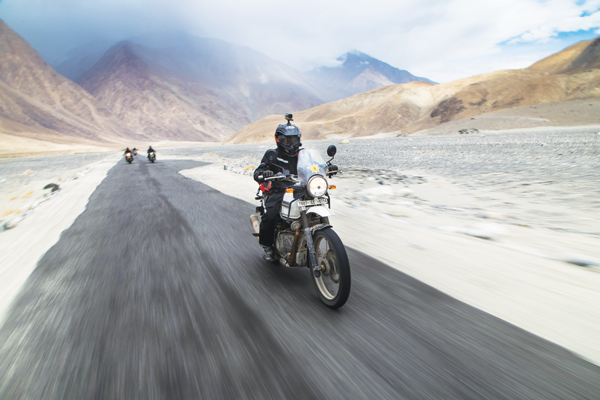 Gaining popularity across the globe, the 13th edition of the Himalayan Odyssey witnessed a participation of over 100 riders (including women) hailing from India, Thailand, Indonesia, Colombia, France and UK. 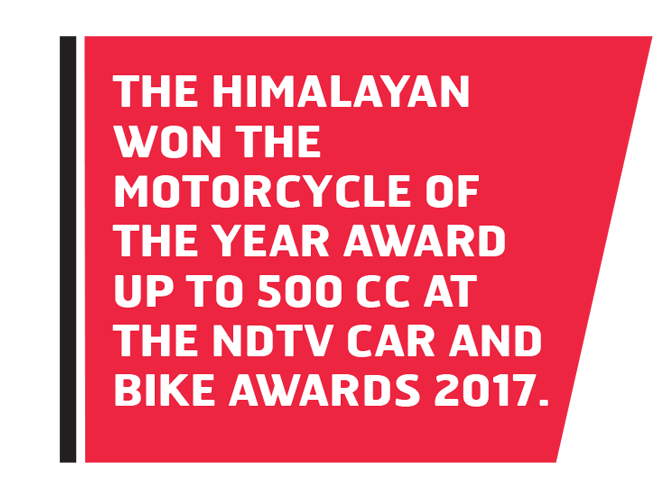 This was the first time when the Himalayan motorcycle was a part of the Himalayan Odyssey. Besides regular annual events like Himalayan Odyssey, this year we introduced new events like Unroad in Goa, Kerala and Himachal. We also introduced Escapade to develop and foster a culture of adventure motorcycling in Indian enthusiasts. While the Himalayan Odyssey tests rider’s resoluteness on gruelling mountainous terrains leading to the world’s highest motorable roads, the other events offer a unique experience of riding through unexplored roads covering dynamic terrains, forests, and stretches of flatlands filled with twisties, technical ascents and descents, water crossings, and meandering pathways. I hail from Delhi and was very excited to make my first off-road experience. These trips cannot be simply put in words, it is something that can only be felt. Travelling a distance of 300 kilometres on a terrain with unexpected ascents and descents, no proper road, sharp bends, and unexplored areas that very few can possibly know of is something you don’t get to do often. Passing through exotic locations and challenging your fears every moment, this trip is certainly every passionate rider’s dream come true. Each day you get to learn something new. I have learnt / gained enough of biking experience in just these three days that I possibly couldn’t have learnt in one year. Presence of professional seasoned riders, special events, safety vehicles, support staff and everything was well arranged. This experience brought out the true rider in me and now I am participating in more such events.